"The Truth" is stranger than fiction. Can You Handle 'The Truth'? NEW YORK, April 24 /PRNewswire/ -- Michael D'Antuono may raise more questions than answers when he unveils his highly controversial new painting, "The Truth" on the South Plaza of NYC's Union Square on the 100th day of Barack Obama's presidency. The artist's politically-, religiously- and socially-charged statement on our nation's current political climate and deep partisan divide has been privately raising eyebrows (and voices) since its creation. The 30" x 54" acrylic painting on canvas depicts President Obama appearing much like Jesus Christ on the Cross; atop his head, a crown of thorns. Behind him, the dark veil being lifted (or lowered) on the Presidential Seal. But is he revealing or concealing and is he being crucified or glorified? D'Antuono insists that this piece is a mirror; reflecting the personal opinions and emotions of the viewer; that "The Truth" like beauty is in the eyes of the beholder. D'Antuono expects that individual interpretations will vary as widely as they do in the political arena. The work will be seen by one viewer at a time behind a voting booth-inspired public installation. Until now, Mr. D'Antuono has chosen to paint purely non-political subject matter, opting instead for iconic celebrity portraits and hard-luck romantic narratives. However, now the artist feels the need to make a statement. "Aided by the media, politics has taken a nasty turn in the last decade and I firmly believe that this is one of the underlying causes of our nation's current problems," says D'Antuono. "The Truth" will be on exhibit on Wednesday, April 29, 2009 from 7 a.m. to 7 p.m. on the South Plaza of Union Square Park at 14th Street in New York City. One question. If elected officials are present, wouldn't that have the effect of mixing religion and politics? 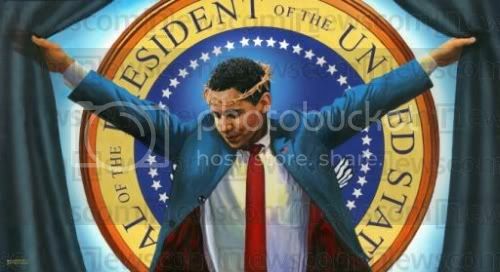 The artist quite clearly portrays Obama as a latter day Christ like figure considering the outstretched arms and the crown of thorns. Obama worship, complete with halo images, has been noted before here on NewsBusters but it was nothing compared to current expressions in awe of The One as we approach his hundreth day in office on Wednesday. The combination of candor and vision and the patient explanation of complex issues was Obama at his best -- and more than any other moment of his first 100 days in office, it summed up the purpose of his presidency: a radical change of course not just from his predecessor, not just from the 30-year Reagan era but also from the quick-fix, sugar-rush, attention-deficit society of the postmodern age. ...The most important thing we now know about Barack Obama, after nearly 100 days in office, is that he means to confront that way of life directly and profoundly, to exchange sand for rock if he can. Whether you agree with him or not -- whether you think he is too ambitious or just plain wrong -- his is as serious and challenging a presidency as we have had in quite some time . . .
Perhaps Obama's most dramatic departure from the recent past is his public presence: cool where George W. Bush seemed hot, fluent where Bush seemed tongue-tied, palliative rather than hortative. Bush would never admit a mistake, but Obama said the words plainly -- 'I made a mistake' -- when his appointment of Tom Daschle as health-care czar tanked, one of the few significant setbacks during his time in office. I've got to look! He signed my book! Remember, Joe and Chris, fervor counts as much as actual singing ability. See you at the unveiling of "The Truth." And for the rest of you in the audience, do try to stifle your laughter during this holy ceremony at Union Square.